Imagine a long, soundless nighttime drive, the highway lines looping past you like cassette ribbon in the dark. Or a phosphorescent campfire in the deep wood, your future written in the smoke. Now let’s say you’re in a foreign concert hall, serving drinks -- you are the oddity, the wisp on the periphery of local consciousness, their language an unfamiliar hum. The patrons move around you as if you were invisible. Indie game developer ceMelusine makes brief, simple games that offer the player poignant moments of loneliness. The interactions and objectives themselves are always simple -- you drive, you gaze into supernatural flames, you pour and deliver luridly-hued cocktails -- but the emotional palette available in these dark, chunky digital spaces is profound. You are skimming these game worlds, but the ‘play’ is occurring among your own complicated feelings and responses. There’s nothing quite like it. In Glitchhikers, the 2014 release that put ceMelusine on my radar (he was one of a team of several who worked on it), a weird red moon hangs forever in the distance as you drowsy-drive along an endless highway, blue-violet landscapes unrolling to either side of your peripheral vision. It perfectly captures the surreal feeling of long road trips that last through the night -- when the car starts to feel barely under your own control, meaningless dials carve luminescent lines in the dash, and you don’t know if the staticky hum of the radio, the murmur of the infinite disc jockeys, makes you feel less alone or more. On this martian highway you pick up passengers, alien-like creatures with polygonal, indistinct faces, and you have the kind of conversations you’ll wonder later if you simply imagined: On the universe and your place in it, on your state of being one of nearly infinite lives dangling from the crepe of existence. The passengers fade away -- they feel like relics of hours or days ago, suddenly, not simple minutes. Glitchhikers does a wonderful job of capturing the transience of time. These days, ceMelusine is at work on a four-game “EP” of games titled East Van. “Basically, I think videogames should be more like music, so I’ve decided to pretend like they are!” the creator enthuses on his online store. And why shouldn’t they be -- if a song is a contained creative statement, an individual mood piece for the listener, so is one of ceMelusine’s games, and a set of four distinct experiences can conceivably make an EP. Oracle feels like a bit of a prelude, the ambient opening track that comes before the complex banger that is Summon the Apgrod, a “dreamy bartender simulator.” You are a disembodied first-person in a world of gray, vacant-eyed teardrop ghosts, all of whom have eagerly lined up outside a cavernous, red-draped concert hall for the eponymous summoning. You, of course, don’t know what an Apgrod is or what will happen. You are not an attendee but a staff member, apparently alone in your task, wielding three unnaturally-colored bottles of spirits (literally: the neon-hued liquids throb with tiny ghosts and throbbing organs). The unsettlingly-solid ghost creatures gather round the bar, the show floor; they move back and forth through a door that will never admit the likes of you. Clumsily you mix the alien liquids according to the silent specifications in the ghosts’ hovering speech bubbles. That’s all they are able to say to you, although sometimes a patron or two seems to be thinking about nonsense sigils. In time, some of them seem drunk, the stardust of intoxication sparkling over their heads. After a while, when you have met enough expectations, you start to learn what the summoning entails. I loved Summon the Apgrod -- I think it would be easy to call it “Lynchian”, as it is increasingly easy to call many games, but it put me more in mind of The Shining, the sense of being in a space between worlds, overseen by some unknown inevitability, at odds with your own nature. 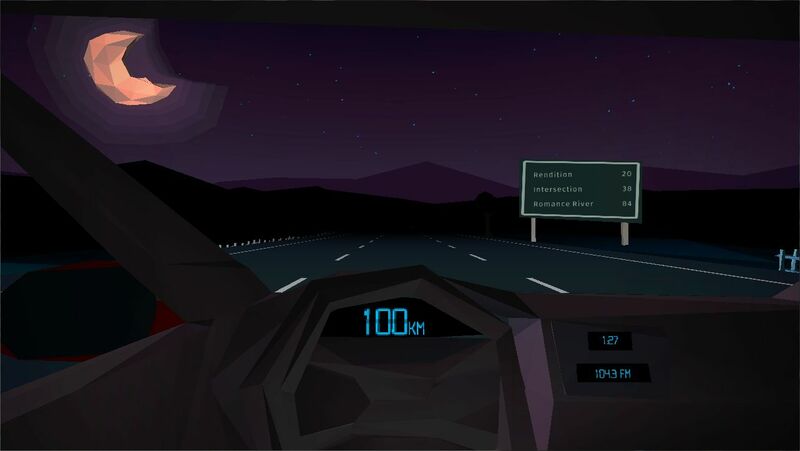 The East Van EP (the name refers to East Vancouver, where ceMelusine is based) is part of the creator’s attempt to encourage more people to experience smaller games. He says he’s always loved music, but can’t actually play much of it. Thinking of games in music’s terms opens up all kinds of possibilities, and many indies are starting to think in this direction: Imagine “albums” of short games from individual creators, or “mixtapes” of many short games by multiple artists. It feels wonderful to remember that interactive entertainment and play in virtual spaces can be about moments and feelings, not necessarily about instruction and efficiency. Re-acquainting with that possibility -- that sometimes, there might be no more important “task” than navigating one’s own emotional landscape -- feels like receiving a message from an eternal temple, a passing blessing from a foreign stranger. It feels like unearthing a rune in the wood. The East Van EP will include four tracks in total; Oracle and Summon the Apgrod are currently available, and two more unannounced tracks will be automatically included with the $6.00 purchase price. Buy it on itch.io.